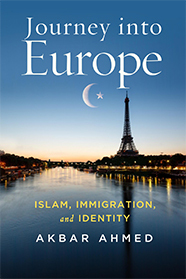 Join Ambassador Akbar Ahmed as he discusses his new book, Journey into Europe: Islam, Immigration, and Identity. The fourth in a quartet of studies examining relations between the West and the Muslim world, Journey into Europe explores Islam in Europe and the place of Islam in European history and civilization on the basis of fieldwork spanning the length and breadth of the continent. Ambassador Ahmed will be joined by Lord Bhiku Parekh and the event will be chaired by SOAS Pro-Director Professor Stephen Hopgood. Ambassador Akbar Ahmed is the Ibn Khaldun Chair of Islamic Studies in the School of International Service at American University in Washington, D.C. He belonged to the senior Civil Service of Pakistan and was the Pakistan High Commissioner to the U.K. and Ireland. He has also taught at Harvard and Princeton Universities and holds a PhD in Anthropology from SOAS. Lord Bhikhu Parekh is Emeritus professor at the Universities of Hull and Westminster. He is the author of several widely acclaimed books including A New Politics of Identity (2008) Rethinking Multiculturalism (2000) and recently Debating India: Essays on Indian Political Discourse, published by Oxford University Press, India. He is the recipient of the Sir Isaiah Berlin Prize for Lifetime Contribution to Political Philosophy, BBC’s Special Lifetime Achievement Award, and Padma Bhushan from the President of India. He is a Fellow of the British Academy, past President of the Academy of Social Sciences and a Member of the House of Lords. Registration: Free but registration required. To register, please click here.